In a few years, RapidRide G will begin service. This will be a major change in the area, bringing fast, very frequent service to Madison Street. At roughly the same time, East Link will be completed, and with it, a stop at Judkins Park. Both of these changes should result in a major restructure of bus routes in the eastern part of Seattle. This area is not to be confused with the “East Side” (i. e. Bellevue, Redmond, etc. ), but the part of Seattle with “east” in their address. This can also be thought of as the greater Central Area, roughly defined as the region east of I-5, north of I-90 and south of the ship canal. Metro has produced a number of route changes in their Long Range Plan (or LRP). I am very impressed with their ideas, and I would be happy if it was implemented as is (and I can’t say that about other parts of the plan). There are some relatively minor changes I would make though, and that is the focus of this post. The following is an interactive map, with a couple options. Each complete proposal is meant to involve the first two items (“Unchanged Routes” and “New and Modified Routes”) along with one (and only one) of the two options. I didn’t include all of the various bus routes, but only those within the region. Some of the bus numbers may be confusing, as they bear little resemblance to the old route. But I figured it made more sense than using four digit numbers, as Metro did. All of the bus routes are meant to be all day, relatively frequent routes (at least every 15 minutes if possible). What follows is a discussion of the various changes. 6 — The new six is identical to Metro’s 3028. Metro has this as a “local”, which is their lowest designation. I think it should be frequent, as I think it would be very popular (it would replace trips that are very cumbersome right now). 14 — Modified slightly to avoid Mount Baker Drive South (the new 60 provides some of that coverage). 12 — Altered to be a north-south bus. This would connect various neighborhoods, creating more of a grid. It would also provide a one seat ride from East Link to Cherry Hill, Seattle U. and parts of Capitol Hill. It helps make up for the fact that the new 60 (just a few blocks to the west) does not connect with East Link. I think the greatest benefit, though, is for trips within the region — it is as close to a grid as you can produce (unless you run a bus down a residential street). 16 — This is based on the 1074, which looks great. The only change is that it crosses Aurora at Harrison. This allows the current 8 (or the new modified 8) to continue on Denny. Doing so provides more of a grid, making it easier for those in north Belltown to get to north Capitol Hill. 27 — This is the existing 27, truncated at MLK. While I like the new 3033 (60 on my map), I have a hard time telling folks on Yesler (including Yesler Terrace residents) that they have to either take two buses, or walk to get downtown. This bus could also provide unique downtown service (such as on the waterfront) in compensation for being somewhat redundant. 47 — This is a combination of the 3122 and 3123. The 3123 (serving Boyer) looks a lot stronger to me. It goes to a more popular area, with greater coverage and fewer traffic problems (the 3122 would get tangled up in the Montlake Boulevard mess). It would be nice to have both routes, of course, but I would rather have better frequency. The 47 would allow folks from Boyer, parts of 24th and Aloha to connect to Pike/Pine. I see this as a fairly popular bus, even though the Boyer part would not have that many riders. 49 — Identical to the LRP 1064. 60 — Identical to the LRP 3033. Option 1 is similar to the changes that Metro proposes in their long range plans. 8 — This is similar to LRP 1061, except that it follows current 8 routing for Denny. Metro has been trying to break up the 8 for a while. I’m not sold on the idea, but it is definitely worth considering. 10 — Modified to serve 19th, retaining service there, and providing plenty of options for a one seat ride to downtown. 39 — Same as LRP 3997. This bus helps cover areas lost by the old 8. It provides a better connection to East Link, but skips part of the Mount Baker neighborhood in the process. It still has a bit of a hole on MLK, but not as big as I originally thought. Many of the potential riders will just walk to Judkins Park, while others will walk a little ways to catch the very frequent 48. Meanwhile, it does provide provide some pretty good connections in the area, including a ride up the hill to Beacon Hill. Option 2 keeps more of the existing network and might prove to more popular for that reason. 8 — Same as today. 11 — Modified to provide excellent service for Madison Park. Folks there would continue to have a one seat ride to downtown (towards Pike/Pine) or a quick transfer to Madison BRT or Link. With either variation, you have much more of a grid within the area. Trips that take forever right now would be fairly easy. In exchange, some riders will have to transfer or walk further to get downtown. But most riders will have plenty of options to get downtown, they will just be different. Aloha will have a frequent connection to downtown, and Madison will have an extremely frequent bus (running every 6 minutes all day). In between there will be another bus (which differs depending on the option) but very few people will have to walk very far to catch a direct ride to downtown. 12 — I don’t expect this to get huge ridership, but be very popular for those that ride it. Since it makes sense as a connection (part of a two seat ride) more frequency could be justified and likely lead to significantly higher ridership (on the bus as well as the system). 14 — Runs every 20 minutes right now, but it would be nice to bump that up to 15 (which could be justified simply because it is shorter). 27– This is a short route that should have high ridership if it can operate every 15 minutes. 47 — As one of the few buses running directly to downtown, I could see this running more often than every 15 minutes. But much of it is coverage in nature, and likely to be a bit bogged down going over the ship canal. Even if it ran every 15 minutes it would be a big improvement for those that ride the current 47. 60 — The new 60 is mostly a coverage bus, but provides some nice connections and front door service to the hospitals. I think 15 minutes can be justified, simply because it should move fairly smoothly throughout the day. 10 (Option 1) — The 10 runs every 15 minutes now, so it would make sense to keep that. 11 (Option 2) — The 11 runs every 15 minutes now, so it would make sense to keep that. 39 (Option 1) — This is a coverage bus. I would like to have all buses run every 15 minutes if possible, so hopefully that would be the case here. Every other new or modified route would be 10 minutes or better. The 6 looks like a critical bus that will change the relationship between Capitol Hill and South Lake Union. The 16 looks even better, running perpendicular to Madison, connecting Rainier Valley, First Hill, South Lake Union and Lower Queen Anne. The 8 and 49 run every 12 minutes, so it would require only a minor improvement to bump those up to 10 minutes. Existing buses would be similar to what they are now, if not better (they all have 15 minute or better frequency now). All of these times are for the middle of the day, and will of course be higher during rush hour. I don’t see any rush hour specific buses for the area (the 43 will be eliminated) other than express buses to First Hill (like the 309). Eastern Seattle is one of the more densely populated parts of the state. There is a real possibility that a very good bus network will operate there, providing not only fast and frequent service to downtown, but to everywhere in that area. First, I really like the interactive map. One minor suggestion for the future would be to have a legend off to the side, showing which color corresponds to which number, without the user having to click to see it, covering half the map. Route-wise, the one I like most is the orange #16, as it fills in a huge service hole, connecting the Ranier Valley, First Hill, Capitol Hill, and SLU, all in a straight line. I’m not sure what the correct answer is for the 47 corridor. It fills an important purpose for coverage, but I’m not sure if there’s any way to do it that’s going to get decent ridership, at least not without a massive rebuild of the Montlake neighborhood with denser housing. I guess it all comes down to how much revenue Metro has available sink on coverage routes. But, if the technology ever becomes feasible, this looks like a great route to serve with a 15-passenger driverless shuttle van. I agree, it would be great to have a little legend. I’m not sure how to do that easily. Right now these are just Google Maps, and they have the check boxes. They don’t have radio boxes, which is what I would actually prefer, since that would let you toggle back and forth between the two options. I suppose I could try embedding the map into a stand alone website, but that is a lot more work. Another option (I just thought of) would be to have little symbols next to each route (which is similar to what Metro does for their LRP). I might play around with that. I agree with your comments about the routes. The 16 sounds like a fantastic bus. I think it would be very popular the day it opened. I think the fact that it would run perpendicular to the most frequent bus in the area is big bonus. The 47 is a tough situation. I think the idea I’ve outlined would work, even though the middle is pretty weak. It isn’t that strange to have the far end of a route (the coverage part of a route) be driven by the stronger part closer to downtown. Under this plan, Aloha becomes a strong option for a one seat ride to downtown, which I think would generate a fair number of riders. I also don’t think the Boren section is that bad. It is mostly single family homes, but they are central Seattle sized lots (packed relatively close together) and there are a few apartments along there. That part is mostly a coverage route, but a pretty justifiable one in my mind, given the density and distance to an existing bus. The nice thing is, if you ran that bus with the type of network listed here, it would provide very good transit options for folks there. It is more than just a ride to downtown and to the U-District, but a good transit trip to just about anywhere. That isn’t the case if you added the bus right now (riders would have to transfer downtown to various east Seattle locations). The only part I don’t like is the bridge crossing. That can thrash an infrequent bus route, turning 15 minute service into a 20 minute wait. You could turn around before the bridge, but I don’t see an easy way to do that. I think you just run it, and take the hit. I really don’t think it will be that big of one, since it works well up to 23rd, and also works well for travel within the U-District. I haven’t gotten into that (the source for another post) but I think it makes sense to have a few buses on the Ave, and a few buses on Brooklyn. For the latter, I would have this bus, the 49 and the 31/32. Just being part of that mix seems like it would bode well for any bus. Worse case scenario I could see a truncated version, like the 3. Run the one bus to 23rd every 15 minutes, while the other one runs every half hour. I would really hate to do that, though — I think half hour buses just don’t work well. Central District restructuring is a pretty complex topic. It’s hard to submit one comment on your ideas! I’ll submit a few “easy” tweak-level comments here. I’m sure I’ll have other observations. Route 39 (LRP 3997) could use Judkins rather than Jackson to get between MLK and 23rd — if the neighbors would be cool with that. Route 4 uses many of those streets today. Let’s recognize that 23rd/Jackson is no longer the “community node” that it used to be and that many residents of this area go to groceries either on Rainier Avenue or in the Madison corridor. South of this, the route could go bavk to MLK using Massachusetts and end at Mount Baker (providing more destinations for CD residents).. I do like the idea of serving Beacon Hill with a Judkins Park connection. I’ve toyed with using other routes (Route 14? Route 27?) I don’t have a simple suggestion at the moment. It’s a matter of service hours. Yes, the Route 14 tail on McClellan should go away. The extension of Route 27 (your 60 and the LRP 3033) southward to end at Mount Baker TC makes much more sense on many fronts. It gets residents direct access to Mount Baker Beach. It gives two-way functionality to the route. It saves driver hours doing the essentially useless tail (and drivers have no break room at the end of the tail anyway). Regardless of other restructuing, this should be done. I’d be happy if it was done in the next year! I looked at the streets between Jackson and the freeway, and understand why Metro went with the route they did. All of the other streets have obstacles designed to limit east-west travel. I realize that the 4 historically went through the neighborhood, but that doesn’t mean it was a good idea. It probably would have been moved a while ago if not for the expense of running new wire. Furthermore, the trip through the residential streets was at the tail end of the route, which means it didn’t effect many riders. If this new route spent a lot of time weaving its way between 23rd and MLK, it would effect a much larger set of riders. There really aren’t that many that would benefit. A fair number of people will just walk to the Link station or walk to the much more frequent 23rd (if they are headed north or south). To be clear, in an ideal world I would like to see that run cut over to MLK at Judkins but I don’t think the neighbors would go for it. This route is not going to involve running new wire, and I doubt folks who live along there would want the extra noise as well as lost parking that would come with a bus route. Nor would Metro want the hassles involved in navigating that section when people don’t park properly. There are three major “changes” that should be considered in a restructuring of this area. 1. The introduction of Link. Link is adding a super-fast, limited-stop transit service. That makes it worthy of reaching for transfers. While central areas can get on Link downtown, it’s often better, faster and closer to use Capitol Hill, Judkins Park or Mount Baker. The Judkins Park station’s 23rd Avenue entrance in particular can be a major game changer. It will not only be a whole new walkshed, but be a Link option for anyone from Madrona to Seward Park. It will be popular for Uber/Lyft, other drop-off and pick-up, bicycle connectivity and nearby transit routes. 2. After the second tunnel opens and the original trunk route is split. Riding from UW to Mount Baker will require a transfer but UW to Judkins Park won’t. The same will be true for University Street and Pioneer Square stations (or the western half of Downtown). That’s in addition to a much faster trip on Link. If it didn’t have a commercial district nearby, I could even see how rail-bus transfers could be way more useful at Judkins Park than Mount Baker because of the disincentive of the added rail-rail transfer coming. Keep in mind that the added rail-rail transfer is a new thing — not even presented before ST3 opeations was analyzed in 2016. The role of today’s Route 48 may or may not be as critical in the future. Judkins Park to UW will be only 17 minutes on Link compared to 32 to minutes on Route 48. Park of the problem with Route 48 is that it’s mostly a residential area between the two stations, with only a little bit of commercial activity at key crossing points (and Garfield High). Back before Link, the route was really important; today not so much. In the future, even less. The coming rail line split even calls into question of if Mount Baker transit center in general will be as relevant as it was before U-Link. Northward, a Judkins Park hub could offer better connectivity. Southward, there is no inherent advantage transferring at Mount Baker versus say Columbia City or Othello except to save travel time for getting to places in the CD. At those other stations, there would also be no escalators or elevators to negotiate; at Columbia City, it seems almost as fast to transfer to Route 106 than go to Mount Baker — just because transferring could be easier and possibly quicker (long MLK pedestrian cycles notwithstanding). 2. The growing areas of First Hill, Yesler Terrace and Pike-Pine. These areas have become extensions of Downtown Seattle. They may not be at the densities of SLU, but they aren’t much less. Certainly using Boren/Rainier as a trunk route would be a wonderful thing although I’m not convinced that Boren could be an efficient route — especially when all the construction is finished. It also isn’t enough in my opinion because it doesn’t provide a direct connection between Pike-Pine and Capitol Hill to Judkins Park. I’ve toyed with different route concepts (split Route 2 at 23rd? Keep Route 4 in place but run it by the Judkins Park entrance and then use Massachusetts to MLK to Mount Baker TC so that your Route 39 could go to Beacon Hill?) Let’s at least recognize that stopping at Walker like today is pretty useless. Back before Link, the route [the 48] was really important; today not so much. In the future, even less. I disagree completely. Link enhances the value of the 48 — it doesn’t diminish it. It is important to keep in mind that the 48 will eventually be converted to RapidRide, along with (hopefully) significant improvements in speed (so called RapidRide+). It will also include the current southern tail of the 7. It is listed as Corridor 4 on the plans: http://seattletransitblog.com/2015/12/21/rapidride-the-corridors/. As mentioned, it would intersect five Link rail stations. This would make it very important for transfers. Consider someone who lives along Rainier Avenue between the main crossing streets (which is where the vast majority of folks close to Rainier Avenue live). They could take this bus south to Rainier Beach, then ride Link to the airport. Of they could ride the bus north and transfer at Mount Baker Station to get to Beacon Hill, SoDo or the stadiums. They could also just ride a little bit farther and connect to Judkins Park to get to the East Side, downtown or even the U-District (as you mentioned). Likewise, someone in the Central Area could take this bus south, and connect to Judkins Park as a way to get to the East Side (always) or downtown (sometimes). Someone in the Montlake area would use it as a way to get to the U-District, either as a final destination, or as a way to get to other Link stations (Roosevelt, Northgate) or just other destinations in general (Lake City, Greenwood). Of course it also works if you are just trying to get from one place to another. A trip from Garfield to Franklin, for example, would involve this bus, as would a trip from Rainier Beach High to either school. This is why SDOT wants to get rid of the southern tail of the 8. They want to focus their efforts on the 48, mainly because it is a straighter, more useful route. It doesn’t have to turn to serve the Link stations, it just runs right by them (with the exception of the southern tail, which is an outstanding terminus, linking the southern end of Rainier Valley with Link). I see your point about the MLK tail. Still it appears to get more riders than the tails of Routes 2 or 3 east of MLK. How about this refinement? Turn Route 3 from Downtown at MLK southward on MLK to Massachusetts to Rainier or 23rd and ending at Judkins Park. That would require moving wire as well as a new bus turn-around at Judkins Park (see the bus turnaround at San Francisco’s Forest Hill Station on a concept how to do this). Replace this by slightly deviating your route 39 using MLK to Union to 34th to Cherry to Yesler (or Jackson) to 23rd to continue south to Beacon Hill. As for service on MLK south if I-90, this would leave the only significant gap near Walker and MLK. With your route 60 serving McClellan, Route 14 buses could turn at Walker and turn again at MLK. Of course, Walker residents may complain about new wires and quiet buses —but maybe not much since no houses on Walker actually face Walker. I appreciate you getting the discussion going. I’m only personally affected because I use Swedish Cherry Hill and go to the Pike-Pine corridor from SE Seattle (near Genesee Park) and find Metro’s current route structure for me requires blocks of walking, double transfers and/or doubling back from Third Avenue Downtown to make these trips of only 3-4 miles that about 10 minutes by car (compared to an unreliable 40 minutes using walking + transit because of transferring and waiting). Still, I am but one more discretionary trip maker; restructuring is an evolutionary process looking at bus route structures from a wide variety of users. Just going by Link stations does not guarantee great ridership. Route 50 goes by three Link stations and has several new 4-6 story residential buildings on the way, yet few are on it. Why is that? It’s likely because there are few non-residential land uses that people want to go to. 24rd is certainly better but except for those right around Mt Baker station, there arent any big commercial districts. There are no hospitals and giant medical centers either. At least Garfield High is on it. I think there is a very credible argument to be made that Route 48 will be mainly a residential Link feeder north of Judkins Park. I’d rather see half of those very-frequent buses head over to First Hill or Capitol Hill where there are bigger attractions. Just going by Link stations does not guarantee great ridership. Of course not. No one is saying otherwise. That is why in many cases it isn’t worth bending the bus route to serve Link. The 10 restructure was very controversial, and it ended being a failure. There just aren’t that many who ride it and transfer. The 50 is infrequent, and serves Link connections that are largely meaningless. Yes, from the Junction you could take the 50 and transfer to SoDo to get downtown, but most people would rather just take the far more frequent C. Same with the Delridge and 35th corridor. If you are headed to the airport from West Seattle, then it is the wrong direction, and there are lots better options. No one in West Seattle is going to transfer to that bus, which leaves it only serving folks who live on a fairly low density area (Admiral Way) or those headed to Beacon Hill or Rainer Valley. Furthermore, it is just an average bus — neither in the top 25% or lowest 25% in terms of ridership per hour (despite its low frequency). It is probably its connections to Link that keep it alive. In contrast, the 48 will be *the only* bus along a far more densely populated corridor. The connections there actually make sense. South to Rainier Beach and then south to the airport. North to MBS, then over the hill to Beacon Hill, SoDo or the stadiums. North to Judkins Park, then east to Bellevue. In every case it is the logical direction, and doesn’t involve going north to go south, or making a same direction transfer at SoDo, while the more frequent bus is about to get off the freeway downtown. It is only for Judkins Park to downtown that you have competition (from the 7). I have no doubt that some will prefer the same stop surface transfer (new 48 to truncated 7) but others will prefer the express subway train that also continues on to serve several downtown locations. North of there it is the same thing. For everyone on that corridor, it will be the only logical way to get to Bellevue. For many, it would be a fast way to get downtown, even if it means backtracking. I think you kind of miss the main point here. The new 48 will have density along the entire corridor and meaningful connections to Link (and lots of buses) and a major destination on one end. It will also be the only bus on the entire corridor. Sure, you could run it less often, but why would you? Some of your suggestions would just confuse matters, or leave big holes. Extend the G north? OK, except now the G goes from being BRT to simply being a very frequent bus. The 48 will get better (making it competitive with rounding the horn at Judkins Park much of the time) but it still won’t be as fast or as reliable as Madison BRT. It is likely that they will make improvements close to the Montlake bridge, but there is still the bridge itself. That means you have added a lot of distance, along with a possible big delay in the middle. With six minute headways, that just looks like a prescription for bus bunching. Now you’ve destroyed your main customer base (the folks who just want to hop on the thing downtown and go up the hill without delay). Meanwhile, what have you really gained? Of course it would be nice to connect Madison with the UW, but that is about it. If you are on Link, you just keep riding the train, for most destinations. This is different than the 48. If you are headed from Garfield to Northgate, you will definitely take the 48, then Link. But Northgate to Seattle U, via your proposed new G route? Probably not. I’ll just stay on the bus until CHS, then transfer to a bus or the streetcar. Anything farther west is probably best done by staying on the train further, and taking the bus back up the hill (even if it does require walking a couple blocks for a transfer). If you go much further east, then you are served by the original 48. There is only tiny holes in which that is better, while you have added great uncertainty (and cost) to the only BRT project in Seattle. There is a reason why Metro keeps trying to kill the 43. It isn’t a good value. If Montlake was a lot more populated — if it resembled most of Madison — then I would say it makes a lot of sense. But it doesn’t. In fact, it is *less populated* than most of the 48 corridor, let alone Madison. Meanwhile, you are sending the 3 out to Judkins Park, thus complicating the 3 and then what? Is it the only bus on 23rd? If so, now you have created a hole in service, and made it really difficult for someone to get south. If you continue to run a 48 you are adding lots of redundant service. Where is this money going to come from? Redundant service costs money. Sending buses downtown costs a lot of money. The 48, with all of its flaws, still runs fairly fast, and will run faster. Buses like the 3 are very slow, and thus cost a lot of money. Making turns costs money. Trust the grid. Sure, there are times when a grid doesn’t make sense, but it is by far the cheapest way to provide anywhere to anywhere service. That is exactly what is appropriate for this area. What you are outlining would mean going back to 30 minute service somewhere, which basically just kills all but an express to downtown during rush hour. You have basically built something as bad as the crap we live with today. Sure, it works for some trips, but doesn’t work for most, even when you live in a densely populated area. 1. Swedish Cherry Hill would be served by just one major bus: Route 3. The only places that it goes are Madrina and Downtown. That’s it. Then, the Harborview slog isn’t removed either. 2. I actually think 9X should be the primary bus route for Rainier rather than Route 7. At least Metro should make it frequent all day. Now that Route 106 connects Mt Baker into Downtown, that stretch of Route 7 generally redundant. Keep in mind that Route 106 was configured after Route 9X was axed. It would go a long way to reconnecting Rainier Valley with First Hill and Capitol Hill. 3. 23rd/24th north of John is expensive mostly single-family homes. It’s clearly not dense! The walkshed is limited by steep hills too. I suspect it’s at a even lower density than along Route 50 in SE Seattle. Except for a very small business district near the Montlake Library, there’s no attractions either until you reach UW. Paying for 1.5 to 2 miles of service to a low-density area like that but not connecting mobility-limited people going to Swedish Cherry Hill and a denser CD to Judkins Park frankly smacks of naïveté if not elitism. 1. Swedish Cherry Hill is currently only served by one major bus route (the 3). Yes, it has two variations but for all practical purposes, it is just one bus route. In the past their was a third variation (the 4) but that only provided a couple other combinations. That is one of the reasons why I made the 12 a north-south bus. It is very difficult to get from Swedish Cherry Hill to Kaiser right now. That has been the case since that was Group Health. (the 4 didn’t help in the least). That is a simple trip between two hospitals (in urban neighborhoods) that takes over twenty minutes right now (the fastest way to get there is just to walk). With this change you would walk a couple blocks to 14th and then ride the bus for five minutes and be there. Likewise, if you are just trying to go south a mile or so right now you have the same problem. To get to Dearborn and Rainier, you might as well walk (Google doesn’t even recognize a bus combination for that trip, despite being a 15 minute walk). It is pretty much that way for any combination along that corridor. You have to walk a long ways, catch a bus, then walk a long ways back. That is what happens when you ignore the principals of a grid and start making buses like the old 4. 2. I was kind of surprised that the LRP sends the old 49 to Beacon Hill instead of MBS (as the 1064). That is another argument for the 12. It may not connect Rainier Valley with the heart of Capitol Hill (Broadway), but it still makes that connection. I could also see flipping the two routes. Have the dogleg west (on Yesler or Jackson) to serve Beacon Hill, while the 49 goes on to Rainier Valley. Ultimately though, I went with what Metro recommended, which also has the advantage of avoiding turns (the new 49 is a straight shot, as is the new 12 for the most part). I really punted on the 106. Now that I think about, it is an error on the map. It shouldn’t exist. Metro only has one bus on MLK (the 1074). That is the 16 on my map. I am tempted to edit the map, although I can’t edit this post, so that might be confusing. I think I may create another map with some of the new ideas (Google makes it easy to copy a map). Anyway, with the 106 gone, the 7 is not redundant. It provides the main connection between Rainier Valley and downtown. Yes, some riders can take Link, but many won’t. Link doesn’t have any stops between Judkins Park and I. D., which is a popular area. Furthermore, many will take the 7 to Link, just as one of the buses that goes that direction. 3. 23rd/24th north of John is expensive mostly single-family homes. It’s clearly not dense! Right, yet this is exactly the area that you claimed should have 6 minute service all day long. Thank you for making my point. That particular part of the 48 corridor does not have a lot of people. I don’t know what your point is, that area is simply on the way. I’m not suggesting (nor is Metro suggesting) anything special for that area (but you are). It is simply a case of taking buses that are going one direction and keeping them going that direction. Our system is full of areas like that. The E literally goes by a cemetery. Should it end before then? Should it detour, to pick up folks in the hospital? No, of course not. It is much better off just going straight down Aurora, despite the fact that much of Aurora has nothing (and makes that part of 24th look like Brooklyn). The 372 spends much of its time on 25th, which is a very low density area. But it is a very successful, frequent bus because it connects Lake City with the UW in a fast manner. The 62 spends much of its time, if not most of its time, in relatively low density area. But it is a connector bus, enabling trips that would otherwise be a huge pain. (I could go on). It is about having buses go straight, and providing a grid. It isn’t about providing folks in Montlake with extra special service. Just to be clear, no one (not Metro, not SDOT) expects the 48 to run as often as the G. But they do expect it to run like other RapidRide+ routes, which is 10 minutes all day long. The folks there (in greater Montlake) are going to have super special service, just like they have today. Again, that is just because they happen to be on the way, not because they deserve it. The point is, that is not who the route is for. It just isn’t. It is for the much larger group of people south of there, as well as those who connect to that corridor. Paying for 1.5 to 2 miles of service to a low-density area like that but not connecting mobility-limited people going to Swedish Cherry Hill and a denser CD to Judkins Park frankly smacks of naïveté if not elitism. What are you talking about? You are comparing the middle of a route with a special connection that would only eliminate a transfer. The only reason the 4 exists is history. That’s it. Right now, the connection you mention simply doesn’t exist. Technically the 4 is still running, but from a practical standpoint, it is gone. Sorry to break it to you, but Cherry Hill is not a huge destination. Sure, there are riders there, but if anything, it gets more service than it should have, given the people there. Right now it has 7 minute frequency in the middle of the day. That is better than the 48 (which only has 10). It is basically being carried by the rest of the line, which has way more people and destinations. You could end that route at Broadway, but that would be silly, since it would lose the connection to the 48, and it doesn’t take long to keep going. The point is, if not for the First Hill section, or the history of that route (being tied to the Queen Anne buses) it would be reasonable to have 15 minute service there. Hell, places like Yesler have 30 minutes service and you think 7 minute service is not adequate. Besides — I am serving that area better than it has ever been served before! For once, folks can get to that area from the north and the south, instead of just one particular, tiny part of the region. Yes, I (along with Metro) want to get rid of something that is currently not running. That means some people will need to take a two seat ride to get there (as they today). That will be a frequent two seat ride because the 48 should run frequently along with the 3. Meanwhile, the Judkins Park to Cherry Hill trip would be a one seat ride with my proposal. That is the 12. Not only is it a one seat ride from Judkins Park (running right by the station, as opposed to the current 4 which you want to preserve) but it runs along Rainier Avenue, which is just as worthy — has just as many people — as the 4. In fact, because it is longer, it has more. More people would have a one seat ride. More people would have a one seat ride, and lots more people would have a two seat ride — for the same cost. That is just the nature of a grid. I don’t want to think I’m whining. Honestly, trying to negotiate a restructure interactively is something that Metro should have been doing all along. An ongoing discussion about how to restructure routes in an open forum is amazing! Kudos to you for trying it! The entire area has many different objectives to the bus service. Reaching many key and varied destinations, reaching regional transit hubs, designing to get buses moving faster than 5 mph, and guessing at service levels based on ridership once new services are added are all very complex. It figure it should take 10 to 20 alternatives and three or four rounds of refinements. Look at how squeezed the ST Ballard-West Seattle studies are to select alternatives in three rounds when the corridors and stations and frequencies are also assumed! I’m not a big supporter of transit “grids” in areas where the geographical issues and travel patterns warp the needs like it does in East Seattle generally. It’s not like a street network where drivers have the option of turning left or right. Each time a transit rider changes routes, there is both a wait and a stop change — usually requiring crossing a street (or sometimes two streets). Grid routes that serve mostly residential areas then become underutilized by riders generally, so that their frequency gets reduced due to lack of riders and that in turn destroys the advantages of a high-frequency transit grid in the first place. I think it takes sufficient density (say 65 foot apartment buildings with ground-floor retail) across the entire area) to create an environment that makes is practical. Most of East Seattle east of 14th is almost entirely townhouses or single-family houses except for small higher-density areas along Madison, at 23rd/Union or 23rd/Jackson — and the steep slopes make the walkshed of stops less effective in several areas. I do like elements of your Route 12 as one option. I think it’s probably more useful than 23rd Avenue is because it has the potential to go near to both Kaiser and Chery Hill, as well as hit the geneal edges of a denser Capitol Hill and Pike-Pine. Because it’s a more level walk than Broadway in the First Hill area, it gives it a nice valley from which to attract riders. 14th can however be horrifically slow and the roadway is very narrow; some enhancements would be needed if buses were on it. 12th is a wide and easier option between Madison and Jackson but it is further from that missing ideal north-south routing need between 23rd and Broadway. I would observe how Metro has actually created more transfers from Southeast Seattle in recent years. Route 9X was also much more frequent. Route 8 used to serve MLK south of Mount Baker; now that trip requires a transfer. Part of my frustration stems from this: an inherent assumption that all routes are to end at Mount Baker Transit Center except one (Route 7 and 106 are essentially one route north of Mount Baker). It seems to suggest that Mount Baker has significantly more importance than I think it should once Judkins Park opens. – begins by making the RapidRide on Rainier essentially follows the Route 9X, and leaves the local Route 7 alone as a short-distance route. – then adds more higher frequency routes that connect to the major destinations in the area in at least three or four directions (and not have most of those routes serving only residential areas). A list of those destinations and a rating of their importance is probably needed to assess how connected they are. – then adds less frequent routes that have a Link station at either end unless is horribly out-of-the-way (and not have most of those route serving only residential areas). If that means going further out of the area to Beacon Hill or UW or Rainier Valley, consider it! I think you’ve forgotten that Yesler Terrace has the FH Streetcar and Route 60 in addition to a route on Yesler. That’s awesome transit service — and not just 30-minute service! It’s just Downtown that isn’t frequent directly — and Route 3/4 is a shorter walk from Yesler than it is from MLK to 23rd in the CD if that trip is important. I’ll close by saying again that — while it’s intriguing to “play” service design manager and sketch out these things — there are many issues from driver scheduling to bus hours to street geometrics to electric wires that govern service design. That’s on top of niche services that aren’t apparent to a single rider (special destinations) that only some riders and (and often the drivers) are familiar with. I continue to hope that Metro initiates a new restructuring effort with multiple alternatives to compare and contrast that involves the public (and not just the LRP with one alternative) as Link and probably Madison BRT approach their opening dates. Thanks again for pondering these things! These are all on Jackson, east of Rainier. There are projects like that all over the place (as well as plenty that have been built since the last census). In general, it is only the far eastern area that is low density, but that is the area that won’t be much different than today (except the routes will be more efficient). You really don’t need Brooklyn level density to make a grid work. You need that kind of density to make a subway work (something ST planners seem to ignore) but not a grid. Vancouver has a very effective grid, and yet a lot of the city lacks the kind of density you are describing. There are lots and lots of single family homes in Vancouver BC, but they actually hold more than a typical Seattle home, because they have such a successful ADU policy (https://www.sightline.org/2013/03/07/in-law-and-out-law-apartments/). The places described in that article have good transit — a really good grid. That is because the density there is not super low — it isn’t super high, but it isn’t super low. A grid there works just fine (https://humantransit.org/2010/02/vancouver-the-almost-perfect-grid.html). Keep in mind, a grid is *more efficient*. This post was written when half hour buses were the norm in this city: http://seattletransitblog.com/2013/08/19/your-bus-much-more-often-no-more-money-really/. It is outdated only because at the current service level, every bus would come a lot more often. Yet with Frank’s plan, every bus comes at least every 15 minutes in the east part of Seattle (shockingly frequent at the time). It achieves that by making a grid. Yes, some relatively common trips require a transfer, but you make up for it with more frequency. Furthermore, there are a lot of trips that now *don’t* require a transfer. For example, a trip from First Hill or various places on Rainier Avenue to South Lake Union would be a simple one — no transfer. These type of trips are very common. Some trips are a bit slower, but a lot of trips are a lot faster. More to the point, every trip is decent. Remember that recent Seattle Times article about Uber/Lyft usage? 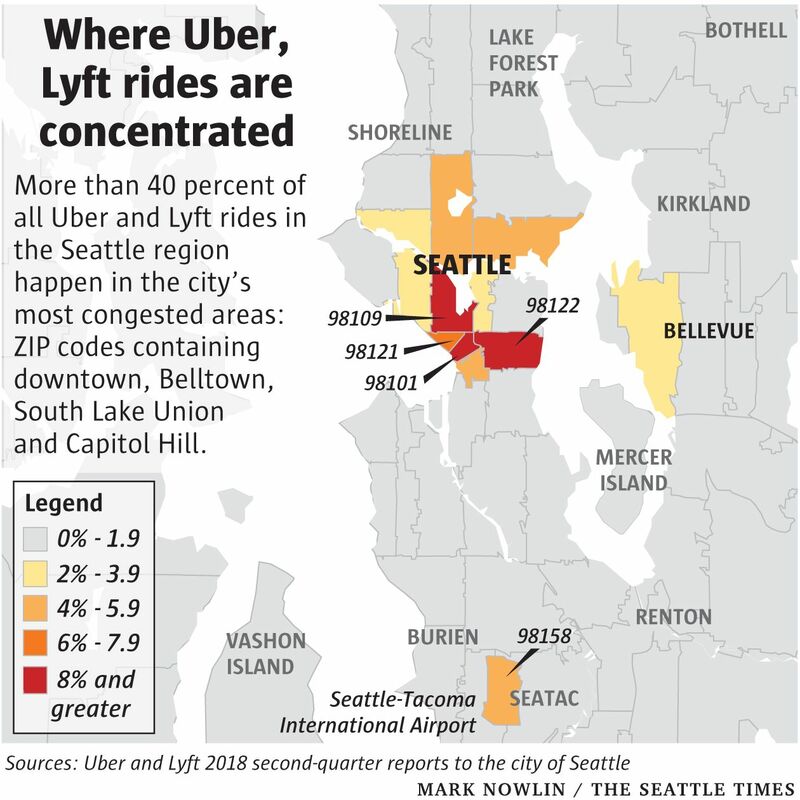 Here is a link to the map: https://static.seattletimes.com/wp-content/uploads/2018/11/Uber-rides-by-zip-code-WEB.jpg. What is striking is that the highest usage is in areas that are fairly dense and have fairly good transit. By Metro’s standards (distance to a frequent bus) those areas are excellent. But Metro doesn’t measure where those buses are headed, which is why so many people take Uber and Lyft (along, presumably, with traditional cabs). If it takes a really long time to get from one place to another (which is often the case if you are not headed downtown) then you call a cab. Building a grid means real competition with driving, while actually adding *more frequency*. I haven’t forgotten anything. The streetcar (and 60) for that matter, are fine for going north (they provide a bit of a grid :)). But the streetcar is pretty much useless for getting downtown from there. Even to the streetcar station, walking is faster (https://goo.gl/maps/upDyvs1vByz). If you are headed towards a typical downtown location, Google suddenly ignores the streetcar (https://goo.gl/maps/AgkxKMNZHpK2). Yes, the 3/4 is an option, but not a particularly good one. It is worth noting that Metro, in its LRP, moves the 3/4 to be closer to Yesler Terrace (basically this: https://seattletransitblog.com/2017/06/22/metro-wants-out-of-james-street-gridlock/). But now they have backed away from that. If that change went through, then my 27 would be hard to justify. But it seems crazy that folks living there have such a tough time getting downtown, since it isn’t really that far away, and there are plenty of people who live along Yesler. It is a judgement call, obviously. But unlike other parts of Yesler, the walk up from Jackson is arduous. For many, it is simply the wrong direction (they would be better off just walking towards downtown). Furthermore, it is a short, quick, straight shot. It doesn’t weave around, or get stuck in horrible freeway traffic (which is why Metro wanted to move the 3/4 over to Yesler, even though it is an obvious detour). As I said up above, it could also serve a different part of downtown (like the waterfront: https://goo.gl/maps/MjtwouSXFTK2). A bus like that would not pick up a huge number of passengers, but it would still be a good value. In terms of total ridership it would look weak, but in terms of riders per hour (a far more important measure) it would be very good. I should mention that my proposal (as well as Metro’s LRP) is not a true grid. There are still lots of buses that work their way downtown and overlap on Pike/Pine. But it is still much more of a grid than before, which means that trips that used to be very difficult (require transferring downtown) will be much simpler and faster. The 2016 Link operational split of the trunk line also affects Madison BRT. Keep in mind that Madison BRT pre-dates ST3 and its trunk line Link split. That split made Madison BRT less useful, even though ST3 puts in a Midtown station on the line. Why? Madison BRT will only connect to the Green Line (Rainier Valley /SeaTac and Ballard line segments). It won’t connect to the Red or Blue Lines (East Link or UW/ Northgate segments) without a few block walk. It also will have several stops, so even with exclusive right-of-way, it won’t be that much of a travel time advantage to make it transfer-worthy compared to just staying on other routes headed into Downtown Seattle. If I lived near Route 2 or Routhe 3/4 or even in North Capitol Hill, I’m not going to use Madison BRT as a route to transfer from — as opposed to using a much faster Link (which is transfer-worthy). It’s one reason that I think Madison BRT really should be extended to terminate at a Link station that isn’t on the Green Line. Turn north and extend to the UW station? That would offload a potentially overcrowded Link segment north of Downtown as well as provide single-transfers to 520 routes. That could then set in motion rethinking the northern end of Route 48 to go into Capitol Hill. The role of Madison BRT really does need to be re-examined in light of ST3. [Madison RapidRide] also will have several stops, so even with exclusive right-of-way, it won’t be that much of a travel time advantage to make it transfer-worthy compared to just staying on other routes headed into Downtown Seattle. Nobody said it would be. Nobody is going to ride the 2, then ride the G to get downtown. Nor do many people ride the 10 and then transfer to Link if they are headed downtown. This explains the big drop-off in 10 ridership, while the 11 has seen a significant increase in ridership. All transfers have a penalty, and there is a significant one for CHS, just because it is deep station. But saying that Link is transfer worthy, while Madison BRT is not is ridiculous. It all depends on where you are going. The shorter the trip, the more that the transfer penalty matters and speed is less important. If I can walk from bus stop to bus stop in 30 seconds, while getting to CHS takes 3 minutes, I’m already way ahead with the bus. If the bus then stops *closer to my destination* (because it is making so many stops) then I’m way ahead. That is what is happening with the 10/11. There are people who used to take the 10, but now find it makes more sense to take the 11 (just because it is closer to where they are). Which is not to say that the transfers to Madison are great. It is flawed for several reasons (not the least of which is our inconsistent grid). But the lack of a Madison bus tunnel stop (which I understand was originally planned, but scuttled for lack of money) as well as the lack of a Link stop at Madison (up the hill) make things tougher. But you still have plenty of transfers. In the case of Ballard/Queen Anne, it is the best option for just about every trip along that corridor. For South and East Link it isn’t bad either. They could get off early, but that is likely to be slower (Metro’s LRP doesn’t even have that option — I would offer a less frequent 12). East Link riders might stay on the train and round the horn and get off at CHS but that really depends on where they are headed. Unless they are heading right to a stop on Broadway or 23rd, they are probably better off with the transfer downtown. South Link drivers (like Ballard riders) are better off transferring once downtown if they are headed anywhere on Madison. Other transfers may not be ideal, but are probably still better off happening downtown. From West Seattle, for example, the transfer requires a walk. But if you are headed to Boren and Madison, that walk is less than other options, while being much faster and more frequent. The same is true for somewhere a bit farther west (e. g. 9th and Spring). In that case, someone could take the 2, but with the Madison BRT running faster and a lot more often, walking the extra couple blocks would pay off. Also keep in mind that while transfers to Link lines are very important, they don’t represent, nor will they ever represent, the bulk of the ridership in Seattle. There will be lots and lots of buses that will connect from bus to bus, and this will happen after ST3 is built out. Many of these buses will continue to go through downtown, which means they will have a stop at Madison. Other buses like the proposed bus on Boren will intersect this bus, making for an excellent transfer. Likewise, there are lots of buses on Third (in places like Belltown) that will result in transfers here, because frequency is often more important than maximum speed. If I’m making a trip of 2 miles (or less — https://goo.gl/maps/uoUJtSGeNFJ2) what matters most is how long I have to wait (as long as the buses are reasonably fast). Then there are riders who are simply traveling along that corridor. There are plenty of people who take a bus from one part of downtown to the other, just because the bus is so frequent. This will be like that, because as you pointed out, it is basically just an extension of downtown. On those several occasions I took the old 10, probably close to half the riders got on and off at a single point: the college campus. I’ve yet to take the new 10, but it doesn’t seem like it has anything like that along it. Sure, it has the Link station, but it only connects Link to the northern part of 15th. I think the problem with the 10 is that riders who are close to the Link station just walk to the station. It is really only when you get up towards Aloha that it is worth the transfer. That is why I ended up moving it to 19th, a bit farther away from Link. I figure someone on 19th and Republican, for example, is more likely to ride the bus to Link than someone at 15th and Republican. This looks good overall. I think the LRP had the 8 split in part to distribute the unreliability of Denny Way while still covering it all the way between Queen Anne and Denny Triangle. It seems silly that except for some peak only FH expresses, there isn’t already a single bus that runs straight down Boren since Boren is a quick and straight shot to northern downtown and SLU. I like the Boyer Ave route because it’s good coverage, but I don’t think it’ll do that well, since the 25 never had the ridership to justify significant investment. The 6 seems almost 100% redundant, and seems to only exist to turn a very specific set of two seat rides (north Capitol Hill to SLU) into one-seat rides, which doesn’t seem like it should be a big priority. If ridership were high in the corridor, then it would make more sense, but since there is not a single bus in the Aloha street corridor, it’s hard to imagine it requiring two overlapping frequent routes in the future. I don’t have a lot of confidence serving Boyer, but I would rather serve it with one route, instead of two (which is the LRP plan). I also think that the overall network makes a big difference. Back when the 25 existed, there wasn’t as much at the UW, nor as much in the greater Central Area (areas with “east” in their address). I know from personal experience that it can make a big difference. There are trips that I just won’t take with a bus, because the transfer is ridiculous, or the bus is just too infrequent. In this case, folks there would have a good connection to a very good network to the south, as well as a good connection to the UW and Link (serving places like Northgate). Even getting to Eastlake would be reasonable. Driving would be significantly faster, but with parking a bit of a problem around Eastlake, and the connecting bus very frequent, it is reasonable to make the switch. But mainly I think it just gets carried along with the rest of the route. In that sense, it is not that different than the 41. Metro used to have two versions in the daytime — one that is truncated close to Northgate, and one that kept going to Lake City. Even though there are better options for folks at Lake City when it comes to getting downtown, Metro is now running buses end to end every ten minutes all day long, even though the section between Lake City and Northgate is weaker. Maybe, but it also replaces some very awkward transfers, and besides, you could probably say that about plenty of buses. The 8 could be considered a bus that also replaces a two seat ride for a specific set of trips. Most of those trips, after all, could be taken by going downtown and then back again. Unlike the 8, I don’t see this bus getting bogged down in traffic. Like the 8, much of the success is due to lots of people and destinations in the area. It isn’t quite as densely populated as the corridor of the 8, but it is still very high. I think ridership per hour of service would be very good. More than anything, though, it is about pushing the grid north (as far as it can go). There are plenty of buses on Aloha, they just all run north-south. Metro hasn’t used that street before, because they have never committed to a grid. The have traditionally run a hub and spoke system, with only a handful of other runs. This made some fairly frequent trips very inconvenient, and has simply gotten worse over time, as both density and traffic has increased. Making things worse, the city has grown out from the center, with areas like South Lake Union being part of downtown. Now you have more of a grid. Just to be clear, I’m not thrilled with having two buses on Aloha — I just couldn’t find a better alternative. It just worked out that way, the way that Montlake gets lots of service (i. e. it just happens to be “on the way”). We could probably live without service there, but for many, that would mean a very cumbersome ride, one that a lot of people simply won’t take. For example, this trip is quite reasonable: https://goo.gl/maps/rijvY1vXH2P2, with a lot density in both places. Yet it takes so long that Google says you are better off walking twenty minutes. This, despite the fairly frequent 70 serving Eastlake. It is pretty much that way for all of Eastlake, and would still be very cumbersome if the 6 didn’t exist. You would take a bus that went downtown followed by a transfer all way at 3rd. Either that, or you are looking at a three seat ride involving the 8 in the middle. The 8, while a straight shot across, will not serve areas to the north as well as this bus, or the Boren bus (the 16). That means a lot of riders to a lot of other areas are looking at transferring to the 16, or walking quite a ways (especially on the Mercer section). The 16 transfer, while not as bad as going all the way down to Third, is still not great. You are still going way south, then way back north again, for anyone who happens to want to go to the north part of South Lake Union. For those along the 49 corridor, it is worse. From Saint Marks you take the 49 south and pretty much have to take the 8, since the alternative is to transfer at Boren and Broadway. I think it is also worth looking at where the overlap is. In both cases it is where there are lots of demand. In neither case will you have full saturation. Having redundant buses run through Montlake is a waste. Having redundant buses on Aloha or Harrison (between South Lake Union and Lower Queen Anne) is not. Yeah, I know what you are saying, and Metro probably won’t provide high frequency on these routes right away. As long as each get 15 I am happy. But I think the numbers on the 6 would be very high (just because of the density, and lack of traffic) while the 47 might be empty much of the way, but really pick up the riders when it makes that turn onto Aloha. Good points about Boyer. I don’t actually quibble with the section on 24th in Montlake, as that’s kind of how it goes, and I actually think it’s hardly redundant with the 48. It’s on a section of the road that is going to get bus priority in the future (I think? ), and avoids the Montlake bridge choke point. None of this was true for the 25, which duplicated the 48 (and 43) from Montlake to UW, then did its loop (which I think should be restored to nearly the original, and be on the tail end of a frequent bus). I kinda see your point about the 6. I still feel like that two frequent buses on Aloha is a bit excessive. And unlike the Montlake part of the 47, it’s a slower road with more stops and no bus priority (and not really much room for bus priority even). I also see some value in having a frequent bus to traditional downtown and a bus to SLU, but that seems like keeping both the 8 and the 43 (in fact it seems hard to call the 43 redundant while not calling either the 6 or the 47 redundant as well). Plus the 10 goes downtown, so people on 19th ave already have a 1-seat ride downtown. 1. Keep the 6, and delete the 47, and have the 6 take over the 47 from Aloha to Boyer and UW. 2. Route the 2 to Pine street like the LRP, but head north on Bellevue Ave like the 47, then turn around and head south on Belmont like the current 47, then terminate at Capitol Hill station. Riders on the 2 will have forced transfers to either the very frequent and fast RR G, or the 10 if they’re going farther north in downtown, the 8 if they’re going to Denny Triangle, Seattle Center or LQA, or the 6 if they’re going to SLU. I still feel like that two frequent buses on Aloha is a bit excessive. Yeah, probably. I’ll admit I struggled with it too. I think if push comes to shove, they would both be 15 minute buses, which would probably be just fine (Good God, I hope we can avoid 30 minute buses, which I consider to be horrible). I think 15 minute service on the new 47, along with 10 minutes service on the 6 would make sense, though. That seems overkill (are there really that many people headed between those two spots?) but I think the 6 will just be very cost efficient. It may not carry that many riders, but riders per hour will be high. Meanwhile, buses like the 10 and 12 only run every 15 minutes, so a similar bus (the new 47) could do the same thing. Then again, they may need to reverse that, just to entice people to accept the changes. If your bus to downtown is a bit farther away (on Aloha, not 15th) then having it run more often makes the change more palatable. Metro has been trying to kill the 2 on Seneca street to downtown for a while, and it is very close to the future G line. And in the 2025 LRP map, the 2 is moved to Pine street into downtown, so they do remove that part. Good catch. I didn’t realize that, and it makes a lot of sense. I like that, and I will change my route accordingly. As far as your idea is concerned, I’m afraid I don’t like it. The 47 performs reasonable well given its frequency. Metro did try and kill it off, assuming everyone would walk to Link. Some do, some don’t. I think the people who walk to Link are simply attracted to its frequency not the speed. If Metro ran the 47 reasonably frequently (every 15 minutes) I think it would perform well. Asking folks to transfer very close to downtown is usually horribly unpopular. That is understandable. When you are trying to go a short distance, speed is less important. Even a very frequent, very fast ride has a penalty, especially if you are going to a different street. I like Metro’s modified 2 idea (a lot) just because it means the bus serves something different than the G. So imagine I’m on the 2, trying to get to Pine (or Stewart, or Virginia, etc.). I have to get off the bus, wait for the other bus (which admittedly should be along very soon) then walk an extra ten minutes or so to my destination (or take a third bus). Or, as you suggest, I transfer to the 10, which currently runs every 15 minutes (and I don’t expect it to be super frequent). I suppose with the savings you could run that every 10 minutes, but still, that is a significant loss for that trip. I’m not saying there is an easy solution. I am not thrilled with mine, even though I think it just a little bit better than Metro’s. But Metro struggled with their plans as well. They still have a 6, which is actually more redundant than mine, since they send the 8 over Aurora on Harrison. They still keep and extend the 47, covering an area that is somewhat redundant (and would be horribly slow much of the day). They still extend a bus out to Boyer (just the existing 12 instead). That has a lot of merit (since it reduces redundancy) but as a result, you still need a bus that goes downtown to the west (in between the 12 and 47, i. e., 19th and Bellevue) and that means they keep the 10. So basically my solution is to flip the 10 on its side, combine it with the 47 and thus have one fewer buses headed downtown. Metro proposes buses on 19th, 15th and Bellevue, while I want 19th and Bellevue. It isn’t that far to walk to get a bus to downtown, while you save a lot in service hours. To really compare my proposal to Metro’s, you would need to look at the frequency. In general, mine is more efficient. That is why I think the 47 can run every 15 minutes, while it runs only every 45 right now. If it turns out Metro can pull off 15 minute service everywhere (and more frequent runs on buses like the 16) then I would be happy with it. My fear is that the 47 would have only 30 minute frequency, which would stink. With your new 12, you’ve disconnected parts of 15th Ave from the north by eliminating what is now a transfer at First Hill station to what is now the 10. Arguably, for grid effects, connecting 15th to the north is more important than 10th because of First Hill station and the connections that provides to the grid on 10th. This is one of the reasons I was asking about what could be done with the north end of the 10 in a comment a few days ago. There seems to be a fair amount of auto traffic that uses 15th and Boston to get over to 10th and then northward to the U district or other points north. 10th and Boston appear to be as wide as any other residential street with bus service, and the only problem I could see is turning onto 10th from Boston. I’m a bit confused with your comment (First Hill Station?) but I think I know what you are getting at. Getting from the north end of the 49 to the north end of the 12 requires two transfers, or a walk and a transfer. That is a degradation, as right now folks transfer to the 10 and head back north. This simply swaps 19th for 15th, in that regard. You are right, and I think it is worth exploring your idea. This new 12 wouldn’t have wire, nor would it need it. The route would stay up on the plateau, which means that extending it to connect to the 49 would be cheap, and add quite a bit to the system. I don’t think that is the case now, as the current 10 is wired, and all the routes go downtown anyway. But with the 49 and 12 running parallel, extending it would make a lot of sense. There aren’t a huge number of people between Aloha/15th and Boston/10th, but making that change would make their lives a lot easier. It isn’t so much for the people between Aloha / 15th and Boston / 10th, but for those coming from further north (U District, Wallingford, etc.) and headed to somewhere on 10th that isn’t necessarily close to an east-west route, and/or saves time over going all the way downtown and transferring to an east-west route. Even if the new 12 is wired, adding this only adds about 8 blocks or so of wire since the 49 is wired too. It looks like Boston and 10th</A has enough space for the bus to make a right turn, but even if it doesn't, you could add a bus turning box like TriMet and City of Portland did here. Yeah, I think that is a big selling point (easy access to 15th from 10th). My point is, I’m still not sure how many people would prefer making that transfer, versus making a transfer that involves a 90 degree turn, especially if the latter is a lot more frequent. There will be crossing buses at Aloha, John/Thomas, Union, etc. For Union (and everything south) you might as well walk it. So that leaves only the places in between the major streets and north of Aloha. I think it adds the most value for folks north of Aloha. If I’m at Galer and 15th, then I would have a good connection to the UW (that would involve same direction travel). That saves 8 minutes of walking (or a third transfer). Everyone north of there benefits a lot (since they have nothing right now). I don’t think that adds up to a lot of people, but it still add value, at very little cost. It also makes the change of the 12 more palatable. Folks along that corridor, who would be losing their one seat ride to downtown would be told that at least they would have very good connection to the UW now. That was supposed to be a response to Glenn’s latest comment. 2 — The 2 follows Pike/Pine, as per the LRP. This is a huge improvement, as it would give riders the choice of downtown locations (Pike/Pine via the 2, or Madison via the G). 12 — I extended the 12 up to 10th and Boston. This provides more coverage, and makes for a faster two seat connection to the UW, for very little cost. 16 — I made clear that the 16 goes on MLK (replacing the 106). 48 — I made clear that the 48 now goes down Rainier Avenue to Rainier Beach (looping around to the station) instead of ending at Mount Baker. 106 — I removed the 106. I do like the changes to have more through-routing destinations at Mount Baker here! It better provides connectivity between SE Seattle and a First Hill destinations. Is Route 48 supposed to be limited stop or RapidRide. Could it use a letter designation? The MLK corridor is pretty frustrating. Plus, no easy turn-around at Judkins Park or at Madison exists. It’s one of those small-area service challenges that may come down to what are reasonably fundable frequencies. There is a stairway at 10th that connects Jackson to Yesler Terrace. There is no adjacent bus or streetcar stop on Jackson. This diagonal challenge may be best met with a better hill climb strategy. So yes, fewer stops. As “RapidRide+” I assume there will be off board payment. By the way, I tried to link to the original document put out by SDOT, but the link is no longer valid. One more way in which Kubly screwed the pooch. Plus, no easy turn-around at Judkins Park or at Madison exists [for MLK]. I’m not so sure. I would assume that the MLK route would use the Madison BRT turn around. I would imagine that is the idea, as it saves considerable time versus the old 8, which has to spend a lot of time making the turn. Yeah, I suppose that would help. But that still leaves folks on Yesler (on different streets) with very little. I understand that Yesler and Jackson are pretty close, but I think there is enough on Yesler to justify 15 minute service (it would be a short, quick run to downtown). As I mentioned before, it would be a perfect choice for sending down to the waterfront. Like Harborview, Yesler Terrace is a three-dimensional problem. Actually it’s only 1/4 to 1/2 mile walk to Fourth and Yesler. Still that’s a pretty stressful hill to climb. I looked at the area again. I had been pushing for a Jefferson funicular from Pioneer Square but that seems overly ambitious. A much more modest strategy could be to put about a 130-foot set of elevators (3?) in a tower st the end of Terrace Street east of Fidth, then build an enclosed walkway to near Harborview and Yesler Terrace. I’m not sure how best to implement a safety/security strategy but a rooftop coffee vendor on top could provide that. Yeah, that would be nice, but I don’t think it is essential, nor necessarily the best value. There are areas that are basically isolated, where transit can’t operate. For example, the waterfront to First Avenue. On many of the streets, you can’t drive up, which means you can’t put a bus there. The elevators that do exist make a lot of sense, and will become more valuable over time. But Yesler is not that way. It is a normal street that can handle buses, and as it turns out, it isn’t that congested. There is more than just the Terrace there. Yes, there is parallel service (on Jackson) but in my opinion, there is enough on Yesler to justify 15 minute service (to MLK). Otherwise, you are basically asking those folks to walk. That isn’t a crazy idea, but that seems a bit much given the density and destinations there. It seems inconsistent to basically tell folks they should walk instead of providing what would likely be a reasonably efficient bus line, while other parts of the city have frequent coverage routes. The 73, for example, spends much of its time serving 15th, thus eliminating a relatively short walk (to Roosevelt). The other parts of the route are either redundant (in the U-District) or overlap with other bus routes (in Pinehurst). As with just about everything in this proposal, though, it all comes down to frequency. If you can’t run a bus there every 15 minutes, then don’t bother. If push comes to shove, then I think we just cut routes and ask people to walk (or make transfers) versus running bus routes so infrequent that hardly anyone rides them. That is the case with the 73, and we should try and avoid that.